McClain’s Colton Mossbarger crosses the goal line in the first quarter Friday at Miami Trace High School where the Tigers battled the Panthers in FAC play. On a beautiful final Friday of September, the McClain Tigers traveled to Miami Trace to battle the Panthers in the first Frontier Athletic Conference game of the season and their Homecoming game. 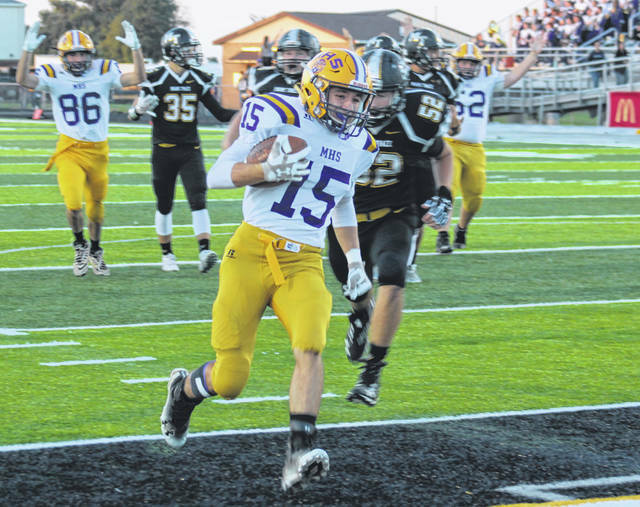 The game was not decided until McClain’s Eric Anderson intercepted a pass in the end zone and ran it back out for the final play of the game, the Tigers holding on for a 47-40 victory. McClain seemed to be able to move the ball, especially on the ground, against the Panthers. Colton Mossbarger got the first of many touchdowns on the night for McClain on a 14-yard run. Braedon Bergstrom had the extra-point kick. The Panthers quickly tied the game with a 21-yard pass play from Tyler Taylor to Brayden Cooper-Smith. Justin Shoemaker converted the extra-point kick with 4:38 to play in the first quarter. The score remained 7-7 after 12 minutes of play. Kyler Trefz scored next for the Tigers on a 1-yard run. The kick was no good. The Panthers responded with a 14-yard touchdown by Josh Liff. Shoemaker’s kick gave the Panthers what would turn out to be their only lead of the game, 14-13 with 8:50 to play in the half. Pat Fout soon ran for 60-yards and a touchdown for the Tigers that made it 19-14. After a Miami Trace punt, Anderson passed to Dalton Mischal for a 39-yard touchdown to up the score to 26-14. Moments later, Taylor passed to Mayer for a 37-yard strike and Shoemaker’s kick to put the tally at 26-21, McClain. Fout was back at it with an 89-yard kickoff return for the Tigers. Bergstrom’s kick made it 33-21, McClain. Anderson had the first of two interceptions to end the first half for McClain. The Tigers scored first in the second half on a 10-yard run by Mossbarger. Bergstrom’s boot gave the Tigers a 40-21 lead. The Panthers began their comeback bid wtih a 37-yard pass from Taylor to Josh Gilmore with 7:19 to play in the game. Richie Everhart had an interception for McClain and the Tigers scored on a 5-yard run by Anderson. Liff scored again on a 5-yard run to make it 47-33, McClain. Dalton Mayer caught a pass for a touchdown to make it 47-40. The score came with 27 seconds to play. Miami Trace got the ball back with 22 seconds to play deep in McClain territory. At the end, Anderson intercepted a pass in the end zone and ran it out for the final play of the game. The two teams combined for over 800 yards of offense. Miami Trace is at Jackson next week.